Am I Ready To Hear What God Says? As the Passover approaches, those of us who believe Jesus intended modern-day Christians to observe it are given a task. 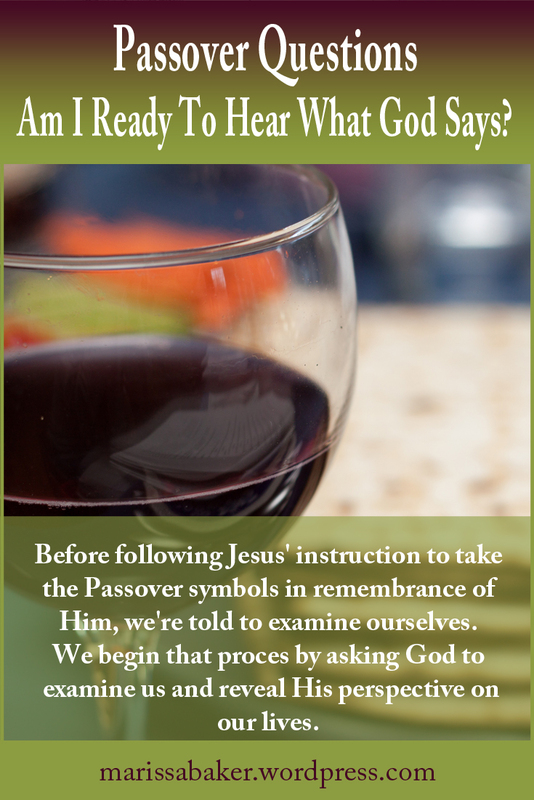 Before following Jesus’ instruction to take the Passover symbols “in remembrance of Me,” we’re told to examine ourselves. There’s no way we can successfully examine ourselves without God’s help. Maybe that should have been obvious, but I only connected it with Passover after hearing Len Martin’s sermon on self-examination (which you can listen so by clicking here; I highly recommend it). We need to ask God to examine us, or our self-examination isn’t going to bear much fruit. While there are Bible stories where God tells people what He thinks of them without being asked, it seems better to have a humble, seeking heart like David’s that asks God to reveal what He finds. The Lord is already searching and knowing us (Ps. 139:1-4), and when we ask with the right attitude, God will show us things about ourselves we would otherwise miss. When we ask God a question like this, we have to be willing to hear the answer. We’re all human and we’ve all done sinful, thoughtless, hurtful, stupid things in our lives. And we need humility to face whatever truths God reveals about our characters. There are two psalms where David prayed to God declaring that he was innocent of transgression. Yet in both these psalms, David also talks about God proving his heart. David might be confident in his resolve not to transgress, but not so confident that he didn’t ask God to hold him on the right track. And he also asked, “Examine me, Yahweh, and prove me. Try my heart and my mind” (Ps. 26:2, WEB. See Psalms 17 and 26). I like Adam Clarke’s commentary on these verses. For verse 20, he says, “If we be conscious that our love is feigned, we shall feel inwardly condemned in professing what we have not.” Beyond that, God “knows every hypocritical winding and turning of the soul” and will judge us justly and “more strictly and extensively than we can be by our own conscience.” And for verse 21, he says that if we’re assured of our own sincerity “and use no mask” then we can confidently appeal to God and come to Him with boldness. To listen to God, we need to make time for prayer, quiet moments of listening meditation, and Bible study. Perhaps start in Psalm 119. If we can love God’s word as much as the writer did and sincerely pray for God to reveal understanding of His ways, then we’re off to a good start. To become the type of person whose heart God approves of, we need to know what He expects and values. We find that by studying the Bible. Teach me, O Lord, the way of thy statutes; and I shall keep it unto the end. … Deal with thy servant according unto thy mercy, and teach me thy statutes. I am thy servant; give me understanding, that I may know thy testimonies. To hear and accept God’s examination of us, we need the humility to recognize Him as the authority. Things that feel right to us or that we can rationalize aren’t necessarily acceptable in God’s eyes. Our self-examination might turn up some uncomfortable things. I think it’s supposed to. The process by which we become like God is compared to refining gold and silver. Like these metals, we’re “heated” to bring impurities out so they can be skimmed off and tossed away. When we ask God to show us the impurities inside us, we need to take His response seriously. Our self-examination doesn’t stop when we learn something is wrong. We’re also expected to study His world so we know what He wants, and we need to repent and change when we learn how we don’t line up with His character. 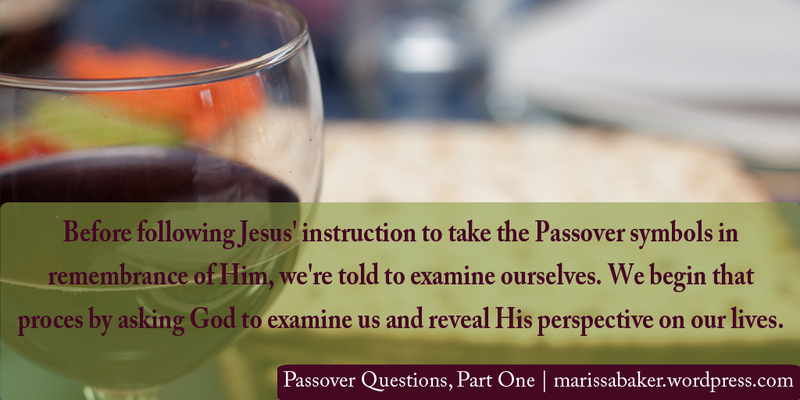 Passover Questions 2: Are There Sins Separating Me From God? Passover Questions 3: How Do I Repent and Change? That blessed me. Thank you! Yes, this is so true! Let me encourage us all to know that whether we are willing to admit our lack or not, it is there simply because we have a sin nature. Rather we should confess our sins to one another and pray for each other so you may be healed…James 5:16. Also remembering that Romans 5:20 says that the Law was given so that we could know our sin to a greater extent, but also knowing where sin increases, grace abounds even more. The fear we have in being honest about our sins is only meant to rob us of our joy in repenting of sins (turning away) and being set free to walk in Gods Holy redemptive plan. We were created with God sized holes in our lives to make room for that relationship with our loving Messiah who only has good plans for us Jeremiah 29:11.